Cannabis remains a Schedule I substance under federal law as of 2014. Under federal law, it is illegal to possess, use, buy, sell, or cultivate marijuana, since the Controlled Substances Act of 1970 classifies marijuana as a Schedule I drug, claiming it has a high potential for abuse and has no acceptable medical use. Some states and local governments have established laws attempting to decriminalize cannabis, which has reduced the number of "simple possession" offenders sent to jail, since federal enforcement agents rarely target individuals directly for such relatively minor offenses. Other state and local governments ask law enforcement agencies to limit enforcement of drug laws with respect to cannabis, however under the Supremacy Clause of the United States Constitution, federal law preempts conflicting state and local laws. In most cases, the absence of a state law does not present a preemption conflict with a federal law. In 2002, Nevada voters defeated a ballot question which would legalize up to 3 ounces (85 g) for adults 21 and older, 39% for and 61% against. In 2006, a similar Nevada ballot initiative, which would have legalized and regulated the cultivation, distribution, and possession of up to 1 ounce (28 g) of marijuana by adults 21 and older, was defeated 44% for and 56% against. In 2006, South Dakota voters defeated Measure 4, voting 48% for and 52% against. Measure 4 was to allow the use of medical marijuana by patients deemed by their physicians to benefit from its use, and was to be regulated by state-issued ID cards and protection of legitimate medical distributors. In July 2009, Gil Kerlikowske, Director of the Office of National Drug Control Policy, clarified the federal government's position when he stated that "marijuana is dangerous and has no medicinal benefit" and that "legalization is not in the president's vocabulary, and it's not in mine." However, a January 2010 settlement between the U.S. Drug Enforcement Administration and the Wo/Men's Alliance for Medical Marijuana (WAMM) provides an example confirming the administration policy as communicated by Attorney General Holder, as WAMM reached an agreement to re-open after being shut down by the federal government in 2002. After the election in 2012, the Office of National Drug Control Policy of the Obama administration stated that it "steadfastly opposes legalization of marijuana and other drugs because legalization would increase the availability and use of illicit drugs, and pose significant health and safety risks". In February 2014, the administration issued guidelines to banks for conducting transactions with legal marijuana sellers so these new businesses can stash away savings, make payroll, and pay taxes like any other enterprise. According to a 2013 survey by Pew Research Center, a majority of Americans are in favor of complete or partial legalization of cannabis. The survey showed 52% of respondents support cannabis legalization and 45% do not. College graduates' support increased from 39% to 52% in just three years, the support of self-identified conservative republicans (a group not traditionally supportive of cannabis legalization) has increased to nearly 30%, and bipartisan support has increased across the board. Republican congressman Dana Rohrabacher introduced H.R.1523 "Respect State Marijuana Laws" on April 12, 2013 with 11 cosponsors of both major political parties. The National Center for Natural Products Research in Oxford, Mississippi is the only facility in the United States that is federally licensed by the National Institute on Drug Abuse to cultivate cannabis for scientific research. The Center is part of the School of Pharmacy at the University of Mississippi. Roger Roffman, a professor of social work at the  The 2007 National Survey on Drug Use & Health prepared by the U.S. Department of Human Health and Services indicated that 14.4 million U.S. citizens over the age of 12 had used marijuana within a month. The 2008 survey found that 35 million Americans were willing to tell government representatives that they had used marijuana in the past year. According to the 2001 National Survey on Drug Use and Health by SAMHSA, a branch of the U.S. Department of Health and Human Services, 41.9% (just over 2 out of every 5) of all Americans 12 or older have used cannabis at some point in their lives, while 11.5% (about 1 in 9) reported using it "this year." In 2009, according to a Zogby poll and an ABC News/Washington Post poll, between 46% and 56% of US voters would support legalization. Under federal law, it is illegal to possess, use, buy, sell, or cultivate marijuana, since the Controlled Substances Act of 1970 classifies marijuana as a Schedule I drug, claiming it has a high potential for abuse and has no acceptable medical use. The Federal government has criminalized marijuana under the Interstate Commerce Clause, and the application of these laws to intrastate commerce were addressed squarely by the United States Supreme Court in Gonzales v. Raich, 352 F. 3d 1222 in 2005. In July 2009, Gil Kerlikowske, Director of the Office of National Drug Control Policy, further clarified the federal government's position when he stated that "marijuana is dangerous and has no medicinal benefit" and that "legalization is not in the president's vocabulary, and it's not in mine." However, a January 2010 settlement between the U.S. Drug Enforcement Administration and the Wo/Men's Alliance for Medical Marijuana (WAMM) provides an example confirming the administration policy as communicated by Attorney General Holder, as WAMM successfully reached an agreement to re-open after being shut down by the federal government in 2002. 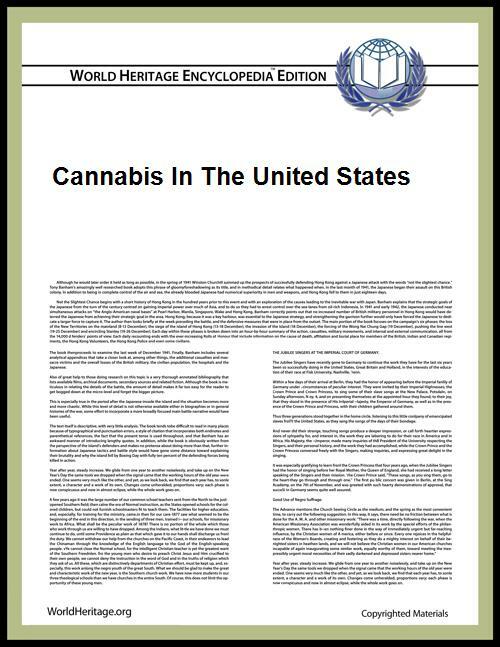 On August 28, 2013, The United States government announced that they would no longer actively pursue marijuana offenses taken place in those states that have legalized the small consumption and possession of marijuana. The Drug Enforcement Agency will only become involved if the offense involve violence or firearms, the proceeds go to gangs and cartels, or when marijuana is distributed to those states where it is illegal. Twenty-three states and the District of Columbia have passed laws allowing some degree of medical use of marijuana, and 14 states have taken steps to decriminalize it to some degree. This movement sought to make simple possession of cannabis punishable by only confiscation or a fine, rather than prison. In the past several years, the movement had started to have some successes. Some states and local governments have established laws attempting to decriminalize cannabis, which has reduced the number of "simple possession" offenders sent to jail, since federal enforcement agents rarely target individuals directly for such relatively minor offenses. Other state and local governments ask law enforcement agencies to limit enforcement of drug laws with respect to cannabis, however under the Supremacy Clause of the United States Constitution, federal law preempts conflicting state and local laws. In most cases, the absence of a state law does not present a preemption conflict with a federal law. In Alaska, cannabis was decidedly legal (under state, but not federal, law) for in-home, personal use under the Ravin v. State ruling of 1975. This ruling allowed up to two ounces (57 g) of cannabis and cultivation of fewer than 25 plants for these purposes. A 1991 voter ballot initiative recriminalized marijuana possession, but when that law was eventually challenged in 2004, the Alaska courts upheld the Ravin ruling, saying the popular vote could not trump the state constitution. In response to former Governor Frank Murkowski's successive attempt to re-criminalize cannabis, the American Civil Liberties Union (ACLU) filed a lawsuit against the state. On July 17, 2006, Superior Court Judge Patricia Collins awarded the Case Summary judgment to the ACLU. In her ruling, she said "No specific argument has been advanced in this case that possession of more than 1 ounce (28 g) of cannabis, even within the privacy of the home, is constitutionally protected conduct under Ravin or that any plaintiff or ACLU of Alaska member actually possesses more than 1 ounce (28 g) of cannabis in their homes." This does not mean that the legal possession threshold has been reduced to one ounce, as this was a mere case summary review filed by the ACLU, not a full case. Reinforcing Ravin, Collins wrote "A lower court cannot reverse the State Supreme Court's 1975 decision in Ravin v. State" and "Unless and until the Supreme Court directs otherwise, Ravin is the law in this state and this court is duty bound to follow that law". The law regarding possession of cannabis has not changed in Alaska, and the Supreme Court has declined to review the case, therefore the law still stands at 4 ounces (113 g). However, federal prosecutions under the CSA can be brought in Federal Court, and federal courts applying federal law are not bound by state court precedent. As such, federal courts in Alaska will recognize that possession of any quantity of marijuana remains illegal in Alaska under federal law. It should be emphasized that legal possession of cannabis is strictly noncommercial. The maximum legal limit is up to 4 oz (110 g) or 25 plants owned for personal use by adults in the privacy of their homes. Possessing more than 4 oz (110 g) or more than 25 or cannabis plants is a felony punishable by up to 5 years in jail and a fine of up to $50,000. Possession of any amount cannabis within 500 ft (150 m) of a school or a recreation center is also a felony punishable by 5 years jail time and a fine of up to $50,000; but if possession is noncommercial and the offender is in their a private residence, an affirmative defense may be raised in court. Possession of marijuana for Commercial reasons regardless of the amount is prohibited by law. Sale of less than 1oz is considered a misdemeanor punishable by one year jail time and a fine of up to $5000. Sale of more than one ounce of cannabis is a felony punishable by 5 years in prison and $50,000 fine. Furthermore, Alaskans cannot maintain any buildings or structures whose sole purpose is to house and or distribute marijuana plant. A petition of 45,000 signatures, originating from a marijuana regulation campaign was submitted to the Alaska Department of Elections on January 8, 2014. The campaign exceeded the required amount of 30,000 signatures from 30 of Alaska’s 40 voting districts to qualify. On November 4, 2014, voters approved a measure to legalize the production, sale, and distribution of recreational marijuana. Possession of larger amounts of marijuana is a misdemeanor punishable by up to $500 and six months in jail under Health & Safety Code 11357c. Possession of hashish or concentrated cannabis is an optional misdemeanor or felony ("wobbler") under Health & Safety Code 11357a. However, under Prop. 36 first- and second- time possession-only offenders may demand a treatment program instead of jail. Upon successful completion of the program, their conviction is erased. Possession (and personal use cultivation) offenders can also avoid conviction by making a preguilty plea under Penal Code 1000, in which case their charges are dismissed upon successful completion of a diversion program. Sale, transportation or distribution of marijuana is a felony under Health and Safety Code Sections 11360. Transporting or giving away one ounce or less is a misdemeanor punishable by a maximum $100 fine. Sale or distribution to minors is a felony under Health and Safety Code 11361. Possession with intent to sell any amount of marijuana is a felony under Health and Safety Code 11359. It is illegal to drive while under the influence of marijuana (or alcohol or any other drug) by Vehicle Code 23152. "Under the influence" is not specifically defined in the statute, but is interpreted to imply some degree of impairment. Therefore the mere fact of having taken a toke of marijuana does not necessarily mean one is DUI. Drivers found in possession of less than 1 ounce (28 g) of marijuana in their vehicle are liable for a maximum $100 misdemeanor fine under Vehicle Code 23222 (larger amounts are punishable under H&SC 11357(a) and 11359). Any person under the age of 21 convicted marijuana related offences will face a 12-month drivers license suspension, regardless of whether the offense was driving-related. Unlike federal law, California law requires a conviction for forfeiture of property involved in a drug crime. Vehicles may be forfeited only if 10 pounds or more of marijuana is involved. Health and Safety Code 11470. Medical patients and their designated primary caregivers may legally possess and cultivate (but not distribute or sell) marijuana under Health and Safety Code 11362.5 (Prop 215) if they have a physician's recommendation or approval. Medical marijuana patients are not protected while on federal park land or forest land in California. CalNORML has received reports of campers and those driving through federal land who are searched, charged with federal possession statutes, and had the marijuana they had obtained under a state medical recommendation confiscated. A California medical recommendation is not a defense in federal court to these charges. In 1975, Colorado passed a law which made possession of one ounce or less of the cannabis plant a second degree petty offense only punishable by a fine of 100 dollars. Thirty years later, in 2005, the city of Denver passed another law which allowed adults over 21 years to possess up to one ounce of marijuana without penalty in the city.But the state still imposed penalties for use and possession of marijuana. In November 2012, the Campaign to Regulate Marijuana Like Alcohol, a ballot initiative campaign backed by the Marijuana Policy Project, successfully passed Amendment 64, making Colorado the first place in the world to have legalized the possession, use, production, distribution, and personal cultivation of marijuana. The Marijuana Policy Project also played a lead role in drafting and campaigning for the historic initiative. The amendment gained bipartisan support, with Coloradans voting for legalization at a higher rate than for President Obama. Arrangements for sale, packaging, advertising and taxation have been discussed, and sale is now legal in stores  It remains illegal to be found driving under the influence of marijuana, while legal possession is be limited to over-21s only and quantities regulated. Growing up to six plants is legal, while it is also be legal to give away small quantities. However, it is illegal to smoke cannabis in public. On June 30, 2011, Gov. Dan Malloy of Connecticut signed legislation into law decriminalizing the possession of small, personal use amounts of marijuana by adults. The new law, Senate Bill 1014, took effect on July 1. Senate Bill 1014 reduces the penalties for the adult possession of up to one-half ounce of marijuana from a criminal misdemeanor (formerly punishable by one year in jail and a $1,000 fine) to a non-criminal infraction, punishable by a $150 fine, no arrest or jail time, and no criminal record. The new law similarly reduces penalties for the possession of marijuana paraphernalia. Possession of larger amounts of marijuana is still illegal and punishable by imprisonment and monetary fines. A subsequent offense of possession of one-half ounce of marijuana is still a non- criminal infraction but the fine rises to $200–$500. First offense of possessing one-half to four ounces is a misdemeanor punishable by up to one year in prison and $1,000 in fine. A subsequent offense becomes a felony punishable by up to 5 years incarceration and $3,000 fine. First offense of possession of 4 ounces or more is a felony punishable by 5 years imprisonment and $2,000 fine. Subsequent offenses are punishable by 10 years in jail and a fine of $5,000. The minimum mandatory sentence for possession of marijuana within 1,500 feet of a school is 2 years’ incarceration (without monetary fine) that runs consecutively with any other sentence. Selling any amount of marijuana is completely illegal and a felony punishable by no less than 7 years in jail and $25,000 in fine. Selling to minors and possessing within 1,500 feet of a school or day care are both felonies which adds 3 years imprisonment to any other sentence imposed. There’s no monetary fine imposed. On June 1, 2012, Governor Dan Malloy signed House Bill No. 5389, which allows the use of cannabis for certain "debilitating medical conditions." On March 4, 2014, the Council of the District of Columbia voted 10-1 in favor of decriminalizing the recreational use of marijuana, replacing jail time for most offenses of private consumption with civil fines. The bill establishes a $25 penalty for the possession of up to one ounce of marijuana, and it labels public consumption a misdemeanor with a maximum penalty of $500 and up to six months in jail. A constitutional amendment sponsored by People United for Medical Marijuana obtained 745,613 signatures by Jan. 24, 2014 (683,149 were required by Feb. 1). The Supreme Court in Florida ruled 4-3 in favor of allowing the initiative to be decided by voters in the November election, which was decided on January 27, 2014. The House Bill and the Senate Bill for the legalization of medical marijuana is called the "Cathy Jordan Medical Cannabis Act" which received its first read on March 4, 2014 and states: "requiring the Department of Business and Professional Regulation to regulate the manufacture, cultivation, possession, wholesale distribution, dispensing, purchase, delivery, and sale of cannabis for medical use and the manufacture, possession, purchase, sale, use, and delivery of drug paraphernalia; providing that the department is responsible for the licensure and permitting of dispensaries and medical cannabis farms and the registration of owners, directors, officers, members, incorporators, employees, and agents of such farms and dispensaries, etc." This bill would create more restrictive rules then exist in any of the other states which have legalized medical marijuana. HB 843 ("Cathy Jordan Medical Cannabis Act") only allows cannabis oil that contains more than 15% of cannabidiol (CBD) and no more than 0.5% THC. The Illinois General Assembly passed the Compassionate Use of Medical Cannabis Pilot Program Act in 2013, which was signed by Governor Pat Quinn on August 1. The law legalizes the use of medical cannabis in tightly controlled circumstances. "Legally registered patients" may, with a prescription from a medical caregiver, apply for an ID card that allows the use of marijuana for medical purposes. The law lists over 30 specific medical conditions that may be legally treated using cannabis, and allows the Department of Public Health to add other conditions to the list via administrative rulemaking. Applications for patients, growers, and vendors began in September, 2014. Possession of less than 2.5 oz (71 g) is a civil violation, punishable by a fine of $200–400. Possession of 2.5 oz (71 g) or more is considered evidence of intent to distribute and is punished as such. Possession of a usable amount of marijuana is lawful if at the time of the possession the person has an authenticated copy of a medical record demonstrating that the person has a physician's recommendation. Possession of greater than one pound of marijuana is considered trafficking and is punishable by up to one year in jail and a fine of up to $2,000. Cultivation of five plants or less of marijuana is punishable by up to six months in jail and a fine of up to $1,000. For greater than five plants, the penalties increase to up to one year in jail and a fine of up to $2,000. For greater than 100 plants the possible punishment is up to five years in prison and a fine of up to $5,000. For any amount of plants greater than 500, the penalties increase to up to ten years in prison and a fine of up to $20,000. The penalty for sale of marijuana is up to one year in jail and a fine up to $2,000. The penalties increase to up to five years in prison and a fine of up to $5,000 if the sale was made to a minor or if it occurred within 1,000 ft (300 m) of a school or on a school bus. Possession and personal use of paraphernalia is a civil violation punishable by a fine of $200. The sale of paraphernalia is punishable by up to six months in prison and a fine of up to $1,000, unless the sale was to a minor, in which case the penalty increases to up to one year in jail and a fine of up to $2,000. Upon conviction, the court may suspend or revoke the professional license of the offender. In November 2013 Portland became the first city on the East Coast to legalize marijuana as voters passed an ordinance allowing adults to possess small amounts of the drug. Marijuana is still illegal under federal law, and is legal only for medical use under state law. Portland’s ordinance does not set up any legal way to obtain marijuana. Possession of less than 10 grams of marijuana in Maryland is punishable by a fine of up to $500 and 90 days in jail. In March 2013, Maryland state senate passed a bill (Senate Bill 297) to be considered by the house of delegates regarding the decriminalization of the possession or marijuana. The bill aimed to make the penalties for possession of less than ten grams of marijuana a civil offense punishable by up to a $100 fine with no time in jail. This Bill was denied on the 19 March however a bill to allow academic research studies of medical marijuana was passed. A proposed bill that would remove all criminal and civil penalties for the possession of up to one ounce of marijuana, allow the personal cultivation of up to 6 marijuana plants by those over the age of 21 and create a system of retail marijuana stores, cultivation facilities, and marijuana product manufacturers is due to be introduced into legislation in early 2014. In 2008, Massachusetts voters approved a ballot initiative to decriminalize a possession of up to an ounce of marijuana, and in 2009, ALM GL ch. 94C, § 32L was enacted into law, making possession of up to one ounce of marijuana a civil offense punishable by a penalty of $100 and forfeiting the drug. There are no other forms of civil or criminal punishments for offenders who are over 18 years of age. Minors are subjected to the same civil penalties as long as they complete the required drug awareness program and community service in accordance with section 32M of the same law. The civil punishment is increased to up to $1,000 if the offender fails to complete the drug awareness program and community service within one year of offense, at which point both the offender and parents are "severally" liable to pay the fine. The law is complicated by the fact that Massachusetts citizens are not legally required to identify themselves when cited with civil infractions. This makes it logistically impossible to enforce the fine. In 2012, Massachusetts voters approved another ballot initiative to legalize possession and use of marijuana for medical purposes. The law puts medical marijuana under the jurisdiction of the state Department of Public Health, which is charged with setting up registration for patients and dispensaries and monitoring the business. Under the law, patients are allowed to possess a sixty-day supply (to be defined by the DPH) and appoint a representative to facilitate their use if they are incapable. The DPH is required to register at least one dispensary per county with a state-wide limit of 35. Possession of more than one ounce of marijuana is a misdemeanor resulting into a $500 fine and up to six months' imprisonment with probation, after which records are sealed. Subsequent offenses are subjected to the same punishments but records are not sealed after probation. The sale of less than 50 pounds of marijuana is a misdemeanor punishable by two years in prison with probation and a $5,000 fine. Subsequent offenders are subjected to up to 2½ years in prison without probation and a fine of $1,000–$10,000. Selling of more than 50 pounds is a felony punishable by 2½–15 years incarceration atop the minimum mandatory sentence(MMS). The MMS for selling up to 100 lbs is one year incarceration plus a fine of $500–$10,000. The MMS for selling 100–2000 lbs of marijuana is 3–15 years in prison and a fine of $2,500–$25,000. The MMS for selling 2000–10,000 lbs of marijuana is 5–15 years plus a fine of $5,000–$50,000 and that of selling more than 10,000 lbs of marijuana is 10–15 years incarceration plus up to $200,000 in fine. Selling marijuana within 1,000 feet of a school or 100 feet of a park is also a felony punishable by two years imprisonment in addition to the MMS and a fine of $1,000–$1,000. In the November election of 2008, more than 60% of Michigan voters supported Proposal 1, and Michigan thereby became the thirteenth state to legalize medical cannabis. On 4 December 2008, the Michigan Medical Marihuana Act was enacted, allowing patients with debilitating medical conditions such as HIV, cancer, and Hepatitis C to legally possess and use cannabis. The patient can have up to two and a half ounces of usable cannabis, and twelve plants kept in an enclosed and locked facility. Recreational use of marijuana has not been decriminalized in the state of Michigan. However, most cities have decriminalization laws. Possession of any amounts of the plant is a misdemeanor punishable by up to one year incarceration and a $2,000 fine, while actual using is punishable by up to 90 days in jail and a $100 fine. If possession is in a public park, the sentence is at most 2 years and a $2,000 fine. Distributing marijuana without remuneration is a misdemeanor punishable by at most one year in jail and a $1,000 fine. Additionally in the November 2012 election, the cities of Detroit and Flint decriminalized cannabis possession of an ounce or less for persons 21 years and older. Ypsilanti, Michigan passed an ordinance to make cannabis the lowest priority for law enforcement activity. The sale and cultivation of cannabis is a felony punishable by up to 4–15 years imprisonment and $20,000-$10,000,000 in fines depending on the number of plants grown and the amount of usable cannabis sold. On May 29,2014 Minnesota legalized medical marijuana, making it the twenty-second state to do so. It is considered to be the most restrictive medical marijuana bill in the country. Smoking actual plant material is illegal. Vapors, oils, and pills are the only legal forms of consumption. House Bill 1231 was introduced by Representative Sam C. Mims (R) and referred to Judiciary Committee on January 2, 2014. It passed by the House by a vote of 119-0 on February 6, 2014 and was transmitted to the Senate on February 7, 2014 which then passed and was amended by a vote of 52-0 on March 6, 2014. The House and the Senate signed HB 1231 on March 30, 2014 which was Sent to Governor Bryant on April 1, 2014. Governor Phil Bryant signed "Harper Grace's Law" (House Bill 1231) on April 17,2014. This law allows "processed cannabis plant extract, oil or resin that contains more than fifteen percent (15%) cannabidiol (CBD) or a dilution of the resin that contains at least fifty (50) milligrams of cannabidiol per milliliter, but not more than one-half of one percent (.5%) of tetrahydrocannabinol [THC]. CBD oil may only be obtained by the order of a physician who is licensed to practice in Mississippi. Administering CBD oil to a patient must be done by or under the direction or direct supervision of a physician. The CBD oil must be obtained from or tested by the National Center for Natural Products Research at the University of Mississippi and dispensed by the Department of Pharmacy Services at the University of Mississippi Medical Center." "Harper Grace's Law" would create more restrictive rules that exist in any of the states that currently have legal medical marijuana. House Bill 1231 only allows processed cannabis plant extract, oil or resin that contains more than 15% of cannabidiol (CBD) and no more than 0.5% THC. Mayor of St. Louis, Francis Slay posted an informal poll on his mayoral website in January 2014, asking his constituents whether or not they were in favour of the legalisation of recreational marijuana and by extension whether the citizens believe that Missouri ought to follow Colorado. The published results stated that over 90% of the people who voted were in favour of the implementation of legalised recreational usage of marijuana, and 70% supporting taxation upon its sale. 30% of those who supported this movement stating they had used the drug in the past week. House Bill 2238 was introduced by Representative Caleb Jones (R) and read for the first time on March 31, 2014; Read the second time and referred to General Laws Committee on April 1, 2014; Referred to the Rules Committee on April 9, 2014; Voted "do pass" by the House Rules Committee on April 10, 2014; Referred for Fiscal Review on April 23, 2014; Voted "do pass" on April 24, 2014; Taken up for third reading and passed by a vote of 139-13 on April 24, 2014; Emergency clause adopted by a vote of 136-14 on April 24, 2014. On April 28, 2014 the Senate read the bill for the first time. The second read was on April 29, 2014 and referred to Senate Judiciary and Civil and Criminal Jurisprudence Committees after which a Public hearing was held. The Senate Committee Substitute voted do pass, and was then referred to the Senate Governmental Accountability and Fiscal Oversight committee on April 30, 2014. The third reading passed in the Senate by a vote of 32-0, sent to the House, which agreed and passed by a vote of 136-12 on May 1, 2014. House Bill 2238, "Allows the Department of Agriculture to grow industrial hemp for research purposes and allows the use of hemp extract to treat certain individuals with epilepsy." The bill demands a neurologist to determine that the "intractable epilepsy" does not respond to at least three treatment options for a person to be eligible to use the marijuana extract. HB 2238 only allows hemp extract that contains more than 5% of cannabidiol (CBD) and no more than 0.3% tetrahydrocannabinol (THC). Currently, under New Hampshire state law, it is considered a misdemeanour to possess any amount of marijuana, subject to incarceration of up to 1 year and a maximum fine of $2000. On the 15 January 2014 New Hampshire’s legislature voted 170 to 162 in favor of 'House Bill 492', based on Colorado Amendment 64, which seeks to legalize under state law the personal use of up to one ounce of marijuana by persons 21 years of age or older and establish regulations for the retail production and sale of cannabis. The vote to approve the bill is the first time a chamber of a state legislature has ever approved of legislation to legalize and regulate marijuana for all adults. Tax issues pertaining to the bill are yet to be debated and a second House floor vote is expected in early 2014. In 1977, the state of New York also passed a law which decriminalized marijuana to a large extent. Possession of 25 g (0.88 oz) or less of marijuana, first offense, is a civil citation with a fine of $100 and the fine is increased to $200 for second offense. A third offense is a misdemeanor and the offender may get 5 days in jail and or pay $250 in fine. Possession of up to 2 ounces of marijuana is also a misdemeanor punishable by 3 months in jail and $500 in fines. Possession of 2 to 8 ounces (57 to 227 g) of marijuana is a class A misdemeanor that may be punishable by 1 year in jail or a $1000 fine or both. Possession of up to 16 oz (450 g) of marijuana is a class E felony punishable by 1–4 years in jail and a fine of $5000. Repeat offenders are mandated 6 months in jail plus a $5000 fine and/or an additional 3–4 years in jail. Possession of up to 10 lb (4.5 kg) of marijuana is a class D felony which is punishable by up to 15 years in jail and/or a fine of $5000 and second offenders must be incarcerated for at least 6 months. Possession of more than 10 lb (4.5 kg) is a class A felony also punishable by up to 15 years in jail and/or $5000 fine. In more recent news, non-smoking medical marijuana has been legalized in the state of New York, only allowing the sale of oils, pills and extracts. Selling or cultivation The selling of marijuana or cultivation of cannabis can be punished by prison sentences and fines which can vary with nature of the offence. 2 oz (57 g) or less is a class B misdemeanor punishable by jail time of 3 months and/or a fine of $500. 24 g (0.85 oz) sale is class A misdemeanor punishable by 1 year and/or $1,000 fine. 25 g (0.88 oz) to 4 oz (110 g) (first offense) is a class E felony punishable by 1–4 years and/or $5000 fine. Second time offenders must do at least half jail sentence. 4 to 16 ounces (110 to 450 g) (first offense) is a class D felony punishable by 1–7 years in jail or $5000 fine (Possible probation if no prior felony offenses). 16 oz (450 g) to 10 lb (4.5 kg) (first offense) is a class C felony punishable by 1–5 years and/or fine of $5000. Second offense time offenders must serve at least half the jail sentence. 10 lb (4.5 kg) or more (first offense) is a class C felony punishable by 1–15 years in jail and/or $5000 fine. Second offense gives 6–15 years prison sentence and must serve at least half the jail sentence. Sale to a minor is a class D felony punishable by 1–7 years in jail plus a $5,000 fine. North Carolina has a two-year legislative session and House Bill 941 is still listed on the official legislature website as of February 28, 2014, but the last action on this bill was in 2013. North Carolina's legislature is in recess until May 13, 2014. HB 941 was led by Representatives Kelly M. Alexander, Jr. (D), David R. Lewis (R), and Pricey Harrison (D) on April 11, 2013; Passed first reading and referred to the Committee on Rules, Calendar, and Operations of the House on April 27, 2013. House Bill 941 establishes a Legislative Research Commission to study "best practices for addressing the production, distribution, possession, and administration of cannabis in the treatment of terminal or debilitating illnesses,". HB 941 also addresses the potential for gained revenues through taxation and licensing fees of distributors. In 1973, Oregon became the first state to decriminalize cannabis. Possession of 28.35 grams (1 ounce) or less is a violation (not a crime) punishable by a $500 to $1,000 fine. Possession of 1 ounce to 110 grams is punishable by 10 years in prison, and possession of more than 110 grams is a felony with punishment depending on the defendant's prior record. In 1998, Oregon voters legalized medical marijuana through Oregon Ballot Measure 67 (1998). In 2013, the Oregon state legislature further reduced criminal penalties for personal possession, expanded the eligibility conditions for the state's medical marijuana program, and legalized medicinal dispensaries. On November 4th, 2014, Oregon voters passed Oregon Ballot Measure 91 (2014) which legalized the sale and use of recreational marijuana. In November 2012 Initiative 502 passed by Washington voters with 55.7% voting for the measure, and 44.3% against. This initiative will allow adults over the age of 21 to legally possess up to 1 oz (28 g) of marijuana, 16 oz (450 g) of marijuana infused product in solid form, 72 oz (2.0 kg) of marijuana infused product in liquid form or any combination of all three and to legally consume marijuana, and marijuana infused products. Prior to the passage of I-502, the city of Seattle had passed Initiative 75, which directed the Seattle Police Department to make marijuana possession its lowest priority. Tacoma passed a similar initiative in 2011. The possession, sale and usage of marijuana in Wisconsin is currently illegal under state law. In April 2014 Wisconsin legalized CBD, a non-psychoactive marijuana extract oil, to treat children with severe epilepsy. On April 1, 2014 voters of Dane county voted on a nonbinding referendum to legalize marijuana. It passed with 65% of the vote. Chart from the United States Bureau of Justice Statistics. Although large-scale marijuana growing operations are frequently targeted by police in raids to attack the supply side and discourage the spread and marketing of the plant, the great majority of those arrested for cannabis are there for possession alone. However, in 1997, the vast majority of inmates in state prisons for marijuana related convictions were convicted of offenses other than simple possession. According to the recent Federal Bureau of Investigation's annual Uniform Crime Report, There have been over twelve million cannabis arrests in the United States since 1996 including 749,825 persons for marijuana violations in 2012. Of those charged with marijuana violations in 2012, 658,231 were charged with possession only. The remaining 91,593 individuals were charged with "sale/manufacture," a category that does not differentiate for cultivation offenses, even those where the marijuana was being grown for personal or medical use. Marijuana arrests comprise almost one-half (48.3 percent) of all drug arrests reported in the United States. The Libertarian Party and the Green Party support the full legalization of marijuana. The United States Marijuana Party also has local chapters in 29 states but there are many state-level parties as well. Members associated with the US Marijuana Party have run for office, including Edward Forchion (for multiple offices) and candidates from the Marijuana Reform Party (for governor). Minnesota has the Grassroots Party. New Jersey has the The Legalize Marijuana Party founded by Joshua McCarterfield III on April 20, 1998. In New York State, in 1998 and 2002, the Marijuana Reform Party of New York State ran candidates for governor and other statewide offices. In 2004, a federal judge held that, by running candidates in 1998 and 2002 statewide elections, the Marijuana Reform Party demonstrated a "modicum of support" sufficient to entitle it to an injunction compelling the state board of elections to recognize the party and allow voters to enroll in it. Viable in New York State because of its unique fusion political system, it remains the only political party in the United States recognized on a statewide level and dedicated solely to the advocacy of marijuana law reform. In the State of Vermont, Cris Ericson was on the official election ballot in 2004 for the Marijuana Party for Governor and for U.S. Senate. It is legal to be on the official election ballot for one state and one federal office. Cris Ericson will be on the official election ballot 2008 for U.S. Congress House of Representatives and for Governor of Vermont for the U.S. Marijuana Party. In Florida the  By January 2014, enough signatures had been collected to place an amendment legalizing the medical use of marijuana. On January 27, 2014 the Florida Supreme Court approved the ballot language. The amendment will be on Florida's 2014 general election ballot. ^ a b "Kerlikowske: Legal pot 'not in my vocabulary' | KOMO News | Seattle News, Weather, Sports, Breaking News - Seattle, Washington | Local & Regional". KOMO News. 2009-08-07. Retrieved 2010-09-15. ^ a b "Santa Cruz medical pot collective settles lawsuit with feds - San Jose Mercury News". Mercurynews.com. Retrieved 2010-09-15. ^ a b "Santa Cruz medical pot collective settles lawsuit with feds". Inside Bay Area. Retrieved 2010-09-15. ^ "Feds Let Banks and Marijuana Sellers Do Business". ^ a b The Editors; Roger Roffman; Wayne Hall; Mark A.R. Kleiman; Peter Reuter; Norm Stamper (2009-07-19). "If Marijuana Is Legal, Will Addiction Rise?". ^ Degenhardt, L; Chiu W-T, Sampson N; Kessler, RC; Anthony, JC et al. (2008). "Toward a Global View of Alcohol, Tobacco, Cannabis, and Cocaine Use: Findings from the WHO World Mental Health Surveys". PLoS Med 5 (7): e141. ^ "Results from the 2007 National Survey on Drug Use and Health: National Findings". U.S. Department of Human Health and Services. 2007. Retrieved 2013-03-28. ^ a b SAMHSA, Office of Applied Studies. "2008 Tables: Illicit Drug Use - 1.1 to 1.46 (PE), SAMHSA OAS". Oas.samhsa.gov. Retrieved 2010-09-15. ^ NORML / By Paul Armentano (2009-09-10). "Over 100 Million Americans Have Smoked Marijuana - And It's Still Illegal? | Drugs". AlterNet. Retrieved 2010-09-15. ^ Grim, Ryan (2009-05-06). "Majority of Americans Want Pot Legalized". Huffington Post. Retrieved 2009-08-31. ^ O'Driscoll, Patrick (2005-11-03). "Denver OKs pot". USA Today. ^ "Bill Status for Governor's S.B. No. 1014". ^ "AN ACT CONCERNING THE PALLIATIVE USE OF MARIJUANA". ^ "Medicinal Marijuana Legalization Measure Signed Into Law". ^ a b Davis, Aaron C. (March 4, 2014). "D.C. Council votes to eliminate jail time for marijuana possession". ^ O'Keefe, Karen. "8 States with Pending Legislation to Legalize Medical Marijuana - Medical Marijuana - ProCon.org." ProConorg Headlines. N.p., n.d. Web. 06 Feb. 2014. ^ "Medical Cannabis Pilot Program". ^ Johnson, Carla K. (21 January 2014). "Illinois Medical Marijuana Rules Unveiled". NBCChicago.com. NBC Universal Media. Retrieved 6 September 2014. ^ Milton Valencia (2008-11-04). "Mass. voters OK decriminalization of marijuana - Local News Updates - The Boston Globe". Boston.com. Retrieved 2010-09-15. ^ Goodnough, Abby (18 November 2008). "Massachusetts marijuana law comes with challenges". New York Times. Retrieved 19 January 2014. ^ Chelsea Conaboy (2012-11-06). "Massachusetts voters approve ballot measure to legalize medical marijuana". Boston.com. Retrieved 2012-11-11. ^ "State by State Laws: Oregon". National Organization for the Reform of Marijuana Laws. 2006. Retrieved 2007-01-10. ^ Robert Capecchi (2013-07-02). "Oregon Governor Signs Marijuana Policy Reforms Into Law". ^ Catherine Fernández (2013-05-31). "Oregon Legislature Approves Adding PTSD to Medical Marijuana Qualifying Conditions". ^ Robert Capecchi (2013-07-08). "Oregon Medical Marijuana Dispensary Bill Sent to Governor". ^ Martin, Jonathan. "Voters agree to legalize pot". The Seattle Times. ^ Bly, Laura (November 7, 2012). "Colorado, Washington OK Recreational Marijuana Use". ^ Drugs and Crime Facts: Drug law violations and enforcement. United States Bureau of Justice Statistics (BJS). The data used to create the arrest graphs is on this BJS page. ^ "Marijuana". Drug War Facts. Retrieved 2010-09-15. ^ "Drug Crimes in the U.S.". Fbi.gov. ^ "United for Care". unitedforcare. Retrieved 28 January 2014. ^ Nohlgren, Stephen (January 28, 2014). "Questions and answers about medical marijuana in Florida". Tampa Bay Times. Retrieved 28 January 2014. ^ Nohlgren, Stephen (January 3, 2014). "Flurry of petitions propel medical marijuana toward Florida ballot". Tampa Bay Times. Retrieved 28 January 2014.